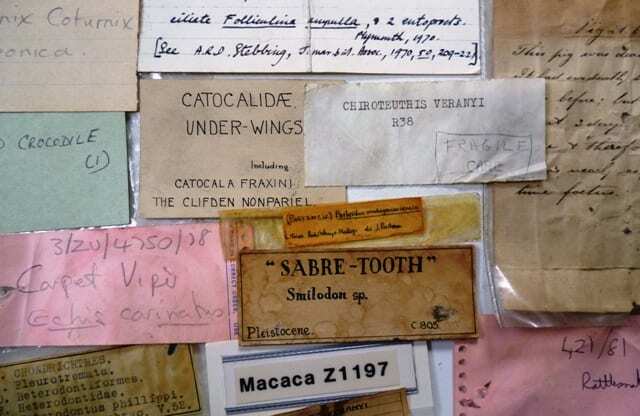 Lost labels from the Grant Museum. Last week, the exhibition Nature Reserves opened at GV Art, London a group exhibition examining the relationship between how humans interpret and archive the natural environment. Tom Jeffreys, the curator of the show, contacted the Grant Museum to discuss some ideas about how natural history museums archive and organise specimens and these discussions lead to us lending a collection of orphaned labels, that cause me great personal anguish whenever I have to add to this sub collection, to the show.